Ram Jack Foundation Solutions owner Rick Sykes has been repairing coastal timber pile foundations for more than 20 years, and he has collaborated with Ram Jack corporate engineers and the management team to co-develop patented brackets and a time-proven process that homeowners can afford. Over time with storms, tidal surges and erosion, above grade homes and structures like the one seen here experience varying degrees of differential settlement due to the failure of the original timber pile foundations. In severe cases, the failures can lead to an unsafe and uninhabitable structure. “Timber piles are typically installed to a depth of approximately 16 feet regardless of the depth to competent load bearing strata in the area”, said Sykes. “In many cases, the timber pile bearing capacity rests largely with skin friction. When beach erosion, wood rot or both effects occur, settlement is almost always the net result”, he added. 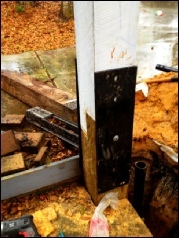 What you are seeing in this photo is a timber pile that had been compromised by wood rot at the ground surface area. The rotting generally happens in about a 10 - 12 inch section of the timber pile from just above grade to slightly below grade. When this occurs, the pile loses its original bearing capacity and differential settlement occurs. An essential step in the repair process is splicing a new timber pile section in place by notching the new section to the existing timber pile using the ship lap cut process. Just prior to completing the splicing process, holes that align with the Ram Jack timber pile bracket are pre-drilled to facilitate the bracket mounting process. Since this work is typically done in a confined area, it is easier to do this prior to the splicing.As the photo to the right reveals, flat eel plates were installed on each side of the spliced piles in order to give the ship lap connection more rigidity. In the picture to the left, we see the top of a helical pile that has been installed adjacent to the existing timber pile. Unlike the timber pile, the helical pile is installed into competent load bearing soil regardless of the depth required to reach the bearing strata. Once the helical pile is installed, the timber pile bracket is mounted to the existing timber pile and also to the adjacent helical pile. Hydraulic jacks are then attached to both piles and the bracket and downward pressure is applied to lift and stabilize accordingly. Now the helical pile provides the majority of the axial compression and tension support instead of the original timber pile. “We have perfected this process over the years to the point where we can complete the repairs for an entire house in most cases in just 3-5 days,” Sykes commented. “The expense for the homeowner is considerably less than having replacement timber piles installed – if they can even be installed at all beneath an existing structure”, he added. As you can see from the photos below of the finished product, the visible portion of the repaired pile has a clean and aesthetically pleasing look, and the homeowner has the peace of mind knowing there will be no more settlement from the repaired piles.